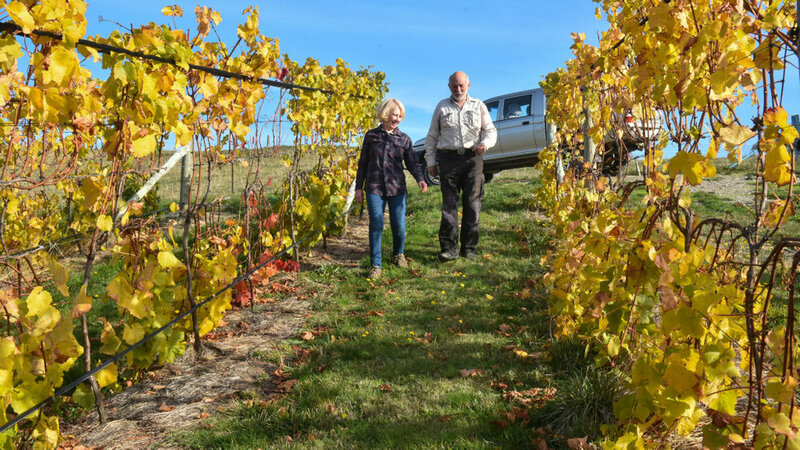 Life has gone full circle for both Harry Rigney & Susan Denny since their return home to Tasmania, after 30 years away. Susan can verify that! From their 100-year-old free settlers’ cottage in North Lilydale, she looks out onto the Bridestowe Estate family history…. recalling the river flats below, once purple with the expanse of lavender fields. A part of the world chosen by her grandfather in 1923, because it had a similar “French” climate; ideal for growing the pure strain of lavender. Ninety six years later, ironically, Harry & Susan are reminded constantly of the many parallels of the familiar lavender industry with another French industry…..their new challenge….wine! The 30-year running away period, mostly was spent hugging the eastern seaboard …. mangrove swamps, tropical islands etc. and, always at sea level. When the urge to return to native Tasmania was too strong, it was most out of character to opt for the high country of Tasmania’s North East. The acquired North Lilydale 50-acre property is at 1000 ft. above sea level! Such is its elevated position, that it boasts glimpses of Bass Strait some distance to the north, and on clear days inland, to the snow caps of Cradle Mountain, over 100 kilometres away. Within the property, the 2 hectare north facing vineyard site, is uniquely positioned. On its frost- free slopes, the alpine effect of cooling temperatures at night, contrasts with much warmer daytime temperatures when the 6000 vines bask in full sun, completely protected by the surrounding foothills of Mount Arthur. A magic formula: 1000 ft. above sea level + cool nights + warm days contributes to the perfect “terroir” for Sparkling. The move south …. previously from the sub tropics to …41 degrees 23 minutes! “Climate Refugees”??? There is much to attract folk to this latitude. An ideal climate for a quality lifestyle… to savour the best of agriculture as well as all the other cultures that flourish in the mix. Harry & Susan were ready to come back. *For the same reasons, in 1923, Susan’s English grandfather Keith Denny, emigrated to Tasmania. Knowing that the highly prized French Alpine Lavender was tainted by hybrid strains containing undesirable levels of camphor, he looked to the other side of the world, free from that risk. Choosing a similar “latitude” to where it grew naturally in France, he looked towards the Southern Hemisphere in North East Tasmania, where he established and pioneered the first lavender plantations of The Bridestowe Estate. Directly above this original site in North Lilydale, the vignerons’ property stands today; proud to carry the name of “Bridestowe Ridge” and its association with the Denny Family. · 1924 picture of The Ridge in the background overlooking the Bridestowe plantations. The Denny trait of “giving it your best” would appear to be strong…. proven by previous generations. Particularly Susan’s father Tim, whose scientific, engineering and agricultural innovations, trail blazed the world’s lavender industry. Susan hopes that just some part of that gene remains! A hard act to follow, but she will say her smartest move was to team up with long term friend/now husband of 21 years…. Harry Rigney! A symbiotic partnership ….each appreciative of the other’s points of character and their respective abilities. Though Harry is always reticent to speak of his own achievements, he brings an impressive list to the partnership. As a young country boy from Tasmania’s North-West Coast, he learned to be practical. To understand the workings of clocks, radios, engines etc. he meticulously pulled apart for the purposes of reassembly. His creative side was manifested also in an electric guitar, joining a rock band at the age of 14 to play weekly gigs along the coast. * Music has always been a big part of Harry’s persona and 55 years on, he’s still in a rock band! Ticking the practical and creative boxes, Harry then excelled academically in his mid- 20’s. As a post graduate, he was the single recipient of a prized national Menzies Scholarship to do his Masters of Law at Harvard University U.SA. Qualifying with a shingle L.L.M Harvard ’80, his academic career has continued for more than 40 years, highly acclaimed as a specialist in the field of Taxation Law. Susan, too comes from a line of academics, but found her personal niche in the Arts and Applied Arts. Working alongside her father “Tim” on the Bridestowe Lavender Estate, she learned to be practical and innovative, as well as realising the rewards of personal effort. She simultaneously completed a Fine Arts degree in the 1970’s, honoured “Dux of College”, (her artwork on the label), as well as mastering oxy and electric welders! Later, those skills assigned her to the restoration of several large sailing boats, including a 40-ft. trimaran…all very large sculptures! Roll forward to 2008….and the prerequisites for starting a vineyard seemed to be in place. The Harry/ Susan combo returned to their roots, seasoned with copious challenges under their belt, and biting at the bit for more! Their vision saw the unique topography of The Ridge site within a wine region that was already winning international acclaim. It suggested great promise. The 6000 vines planted in the Summer of 2013/14, and 2 successful vintages to date, have produced healthy grapes of exceptional colour and composition, in bumper crops. Harry & Susan strive to better their practices every day. Taking in the need to continually improve; be it working harder, thinking smarter, listening to others in the industry more attentively, or applying better systems for viable, sustainable vineyard and property management. It has earned them the Best Small Vineyard Tasmania 2017.